Have you heard of the PJ Library? It is a Jewish family engagement program implemented on a local level throughout North America that distributes Jewish children's literature and music to families. Check out the website: http://www.pjlibrary.org/ . Take a break from the bustle and treat yourself and your family to a holiday story, movie, and cookies on Thursday, December 15 at 6:30-7:15 pm. Wear your pajamas if you dare! November is National Picture Book Month! No matter your age, there's a picture book for you. Explore our collection--you won't be disappointed. These books are available for checkout along with several other selections of interest to parents. Lists of parenting books on specific topics are available in the library or online. (Click the "Parenting Books" link to the right). Michael Clough of the Vermont Natural History Museum brought a red tailed hawk, a kestrel, and a saw whet owl to the library. 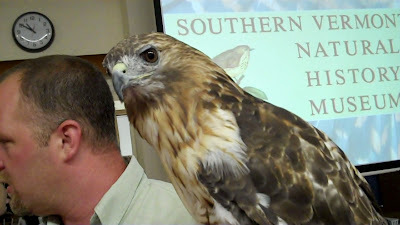 We all enjoyed seeing these magnificent birds and learning about them and their relationship with humans. ...we all scream for ice cream! All ages are invited to "Ice Cream, a Story, and a Movie" Wedensday, July 6 at 10:00 am at the library. See you! Sign-up for the Summer Reading Program NOW!! There's something for EVERYONE, no matter how young or old!!! ... to sign up for the Summer Reading Program! Register in person or online all day, every day beginning Monday June 20. Click the link to the Summer Reading Club Blog for more information (below, right under "Things You Need to See!"). Check out the many scheduled programs by clicking the calendar links. I predict a fun summer! Check out the schedule of Children's and Young Adults' Summer Programs by clicking on "Summer Preview" (under the tub). Let's Do Nothing by Tony Fucile, that received the Red Clover Award. 11 Birthdays by Wendy Mass, the Dorothy Canfield Fisher Award Winner for 2011-2012! Hear what the authors and illustrators of this year's award winning books have to say at www.teachingbooks.net/Awards2011 . Clare Vanderpool, Erin Stead, Sy Montgomery, Bryan Collier and others will share with you insights about their craft. After you've listened, take a look. You'll find most of the award winners here, at the library. The Mad Scientist program scheduled for Wednesday, March 23 has been cancelled due to illness. It will be rescheduled soon. Here's a new website to check out: www.slimekids.com/ It has book trailers, reviews, author information, reference links, and games. Take a look--it's free! This webinar is easy to participate in wherever high speed Internet access is available (like at the Springfield Town Library). Log in 5 minutes before the session begins and turn on the computer's sound/speakers. The winners of the Newbery and Caldecott Awards plus others have been announced! Moon Over Manifest by Clare Vanderpool is the Newbery winner and A Sick Day for Amos McGee illustrated by Erin Stead (written by Philip Christian Stead) received the Caldecott. For details and the big list, click on www.ala.org/ala/newspresscenter/news/pr.cfm?id=6048 . Many of the winners are a part of our collection and are available for you to borrow. Calendars will be distributed in the schools soon.